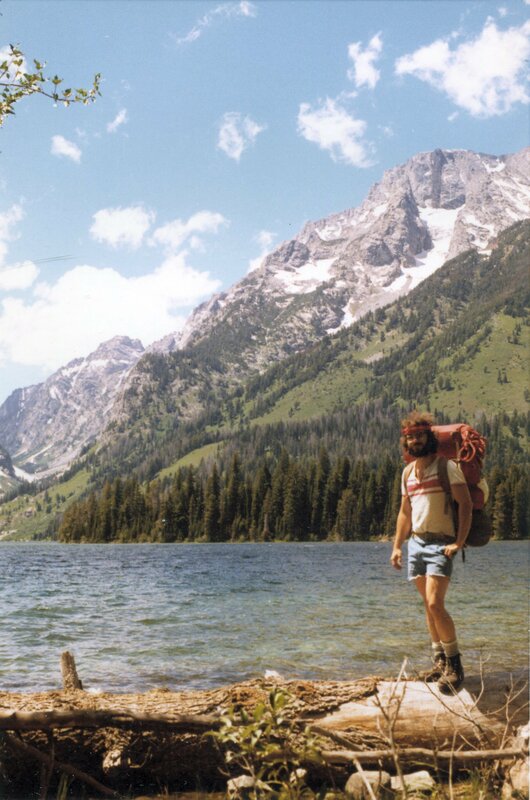 Late one morning in July 1972 Eric Engberg and I plodded along the trail skirting the south shore of Leigh Lake in Jackson Hole under blue skies and the weight of oppressive packs. Sunlight filtered through the leaves of the trees casting little dancing circular spots on the dusty trail ahead. I scrutinized them closely and, an hour or more from our start at Jenny Lake, began to see, as expected, that they had become tiny crescents like the sickle of the new or dying moon. A partial solar eclipse (July 10th) was by then well under way and the light had dimmed noticeably. I had fun accosting the occasional oncoming hikers—especially those with kids—to point out the little solar images. Many seemed unaware that an eclipse was in progress and almost none had ever realized that the little circular spots seen on any day in dappled sunlight are crude pinhole camera images of the sun’s disc. We aspired to climb 12,600 foot Mt. Moran whose summit was more than one vertical mile above where we stood then on the trail. At dawn the previous morning, after a seventy-five mile drive from Buford in the high country of the White River and after having nearly collided with two deer on the darkened road, I had picked up a grossly sleep-deprived Eric at the Greyhound stop in Craig, Colorado. The prospect of the adventure ahead excited me and I felt a bit guilty over having left my family behind at the dude ranch where we had been vacationing for a week. 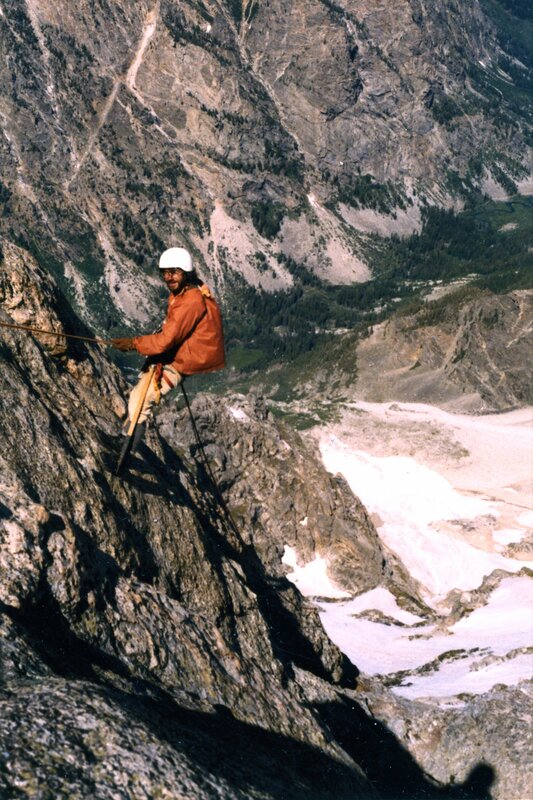 Eric had hoped to climb the Grand Teton; not “counting” a previous guided ascent made earlier in his boyhood. But, since I had climbed the Grand, I argued for something new to both of us. We settled on Moran—third highest in the range but not unduly technical. A worthy objective in our muddled state of altitude acclimatization. I had slept for a week above 8,000 feet whereas Eric had just stepped off the bus. I was forty-seven; Eric about twenty. At the end of the lake the trail branched left, leaving the well trodden path for one gradually much less well-defined, where we hoped to find relatively easy passage to the lakeside base of the Falling Ice Glacier couloir. The hoped for easy passage rapidly became almost impossibly difficult owing to the awful condition of the trail much of which became hardly discernable in dense underbrush and in an endless hodge-podge of downed trees which barred our path at almost every step. At many of these we had to remove our packs to crawl under or to struggle over them. We argued about trying closer to the lakeshore and then, after thrashing through brush and over huge boulders all the while trying to keep our feet dry, we argued again about trying along the higher ground away from the lake. It must have taken three hours to cover the one and a half miles. Finally, exhausted, we rested by the lake at the bottom of the couloir. It rose, a great tan scree and boulder filled gash,straight above us for another horizontal mile. 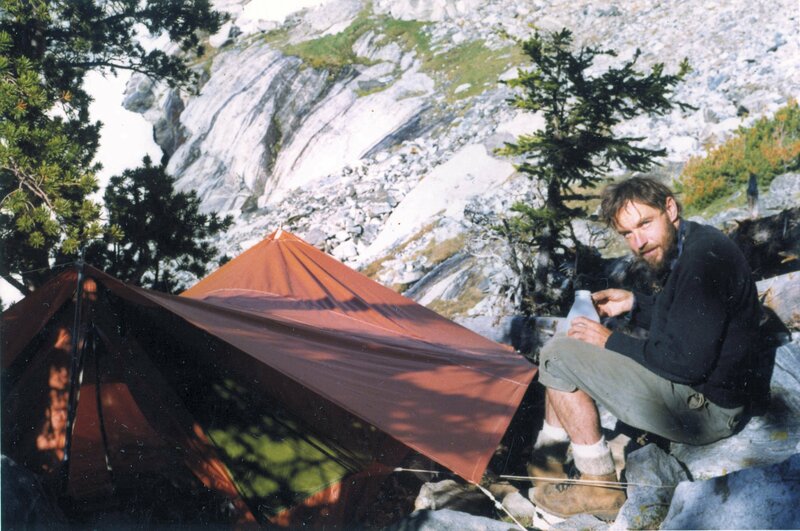 Our destination was the Guide’s Camp on a ridge west of the glacier at 9,600 feet where climbers had cleared scattered, rock-rimmed tent sites among the trees and had found water nearby. Only twenty-seven hundred feet to supper and bed. We started up, forthrightly at first and then more and more slowly and painfully as it became evident that the footing was terrible even on what seemed a worn but erosion-scarred path. Because only a few hundred years had elapsed since the snout of the glacier had receded from the lake to its present high elevation the newly exposed ground was completely unconsolidated by rain, weather, vegetation, or frost. At every step our feet slid back in the scree and after having tried to walk instead on the loose boulders we had to give that up too as every rock stepped upon either moved or rolled in some devilishly unpredictable way. Hour followed hour. I moved slowly enough but Eric began to feel the effects of the thinning air. Oh, we thought that couloir would never end! But gradually, eventually the snout of the glacier seemed closer and we came under a steep and wooded ridge to our left about five-hundred feet above us. Up this the trail narrowed and zigzagged endlessly but the footing improved; this part of the trail having emerged from under the ice perhaps several thousand years earlier. At the ridge and after following it upward for another three-hundred yards or so we found a small tent site among the evergreens and located the source of water. We put up the tent and cooked in the fading light. Eric didn’t feel so well; the sudden change in altitude was taking its toll on his inner man. Early to bed for an alpine start in the morning. We rose in the dark and made breakfast. I don’t think Eric slept as well as he might have but he professed to feeling much better and we agreed to go on. The sun was high as we came under the spire of the West Horn and it must have been late morning when we gained the summit of Drizzle Puss at about 11,500 feet. Here we had to set a rappel to descend a hundred feet or so into the notch between Drizzle Puss and the summit massif. Moran’s entire east face was spread before us and the prominent Black (basaltic) Dike thrusting eastward seemed like a gigantic staircase leaning against the mountain’s face. I recall thinking that the next time I came here I would do the Dike route. We stood about even with the summit of the West Horn; a slender, golden finger like a window mullion splitting the valley view into two halves. The Falling Ice and Skillet Glaciers slid away below us and beyond lay Jackson Hole filled to the north with Jackson Lake and the soft green and brown of the prairie. In the purple distance—the Wind River Range. The thousand foot east face—the CMC (Chicago Mountaineering Club) Route—went well. It was steeper than anything below but the rock seemed good and we progressed rapidly, roped up but moving together, swapping leads, and placing protection from time to time; what climbers call “fourth-classing”. We passed the base of Unsoeld’s Needle, a prominent feature on the face which we hadn’t even noticed before from Drizzle Puss owing to its casting no shadow at noon and blending in perfectly with the rock of the face itself. We reached the summit in good time—a huge rock-strewn table covered with a jumble of rocks and huge blocks of pinkish hue very different from the granite of the mountain’s main mass. These remain the last remnants in the Teton Range of an ancient sedimentary over layer pierced and lifted by the uplifting granite later worn away over the aeons. On the sharper summits of the southern peaks one finds no trace of it. In descending the face we lost the route that we had followed climbing up. Unaccountably we traversed too far south, to our right, so that it seems to me that we passed eventually south of the base of Unsoeld’s Needle and followed a difficult and relatively unsafe path back to the notch, which we even had a hard time recognizing. I remember loose rocks, some scary downsliding, and roped passages where the last (high) man was not enviably positioned. Fortunately, at the notch, we found a route up the one-hundred foot precipice that “went free” and within our abilities and so we gained Drizzle Puss again and our campsite in time for dinner. The next day we packed down but the footing in the couloir and my boots conspired to raise huge blisters on the soles of my feet; blisters almost the size of dollar bills. While fighting our way back along the lake shore passage, curiously, we found a wisp of smoke rising from a small patch of smoldering pine needles and duff. We filled our pots at the lake and smothered it. I swore that if I ever returned to Moran I would come across the lake in a canoe *. We took a rest day at the American Alpine Club Climber’s Ranch while I saw to my feet. I drained the blisters and flattened and taped them securely to the inner skin layer in such a way as to prevent any possible lateral slippage. In Jackson we became tourists, went to the Silver Dollar Bar, shopped for supplies, and walked through the central park: the “only place in the world whose park gates comprise dead animal parts” according to our friend Al Stebbins. We had a nice dinner and decided to start, the next day, for the second highest in the range, Mt. Owen (12,900). After a morning of packing at the Ranch we drove to Lupine Meadows and began a three-thousand foot pack-up to Amphitheater Lake. Five long switch-backs to the Garnet Canyon cutoff and then about ten shorter ones passing Surprise Lake on the way—all together about three hours with a pack if you’re fit. The first-aid I had given my feet seemed perfect and I had no further discomfort. At Amphitheater Lake I spent some time looking for a cave we had occupied in 1957 and eventually found it. We put up the tent and cooked dinner. At an overlook a little farther on we stood for a while in the fading light studying the Teton Glacier and its moraines, and the south faces and snow slopes of Mt. Owen beyond. We could see our route in its entirety. Without a problem we made an early start before dawn; up to the overlook, and then down a steep five-hundred feet or so to the bottom of the glacier’s terminal moraine. Climbing the moraine to the ice above was a scramble of several hundred feet after which we angled north-westward across the snowless (“dry”) ice toward the bottom of a snowfield leading to the narrow snow couloir descending from Owen’s East Prong. We found the crevasses all perfectly visible and easy to avoid. 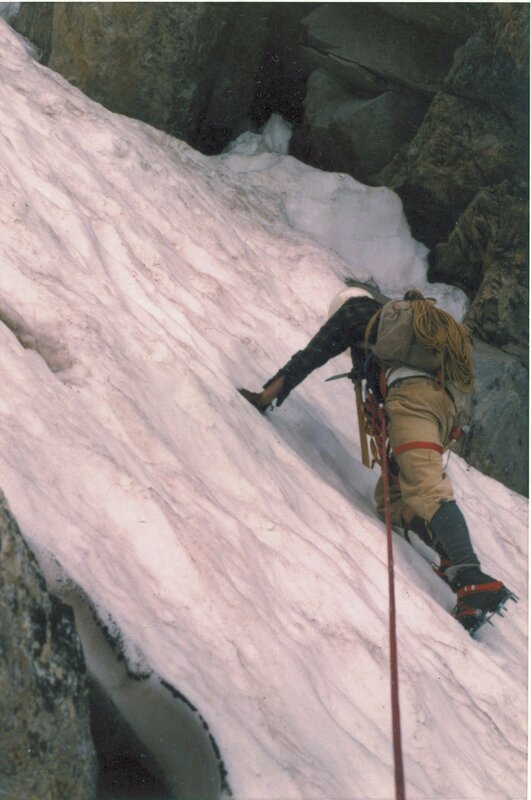 We had each an ice axe and crampons and, together, two ropes; forty meters of 11mm kernmantle and an equal amount of 1/4 inch (light) laid Goldline to permit long rappels. The morning sparkled crystal clear. At the base of the one-thousand foot snowfield descending from the East Prong the bergschrund gaped large and deep. But, as luck would have it there appeared, not far away, a snow bridge spanning the gap. It seemed marginally safe—pretty thick in depth but narrow, maybe six feet wide. Eric elected to lead and I took him on the doubled rope. Gingerly he stepped up to the bridge and started across the ten foot span. Suddenly I heard (and felt) a “whump”! The bridge had settled a bit but held. Eric belayed me across. We started unroped up the steep snow, steep enough so that without self arrest a fall would prove unstoppable. I had had some ice and snow experience by then but Eric had little and let me know that he felt uncomfortable with the steepness and kicking steps without crampons. So we roped up and I led the pitches while Eric followed and gained confidence. It was slow going and after an hour or so we saw another rope of two crossing the glacier far below us. They moved fast and it became clear that they would soon catch us up. This they did, at the base of the East Prong. They hailed, incongruously, from the Florida Mountain Club and obviously had a lot more confidence on steep snow than we did. After an exchange of pleasantries they passed ahead and out of sight above. Suddenly, silently, nature sent us a signal. 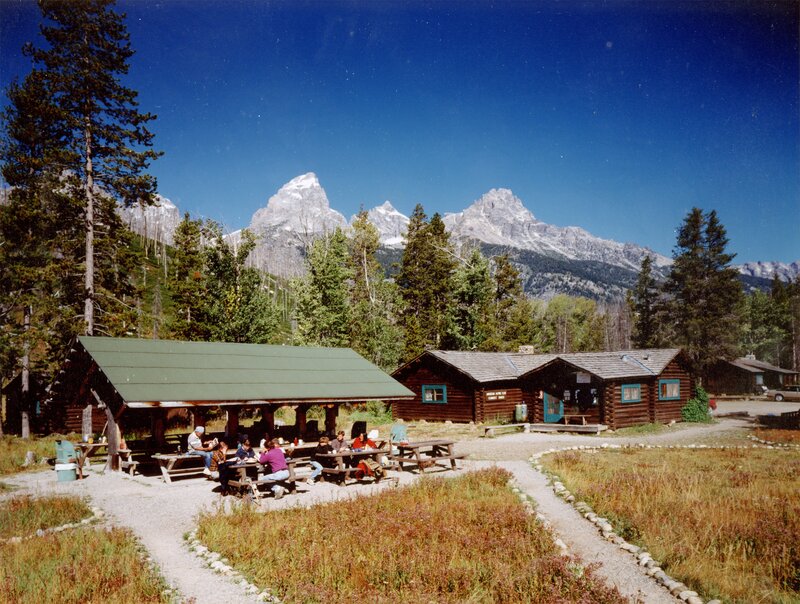 In the dark clear sky a tenuous banner had silently and surreptitiously formed streaming to the east from the very tip of the peak of the Grand Teton towering over us to the southwest. We watched. It grew slowly in size and a minute or two later Eric said “Look”; a banner had formed on Owen’s summit as well. As we climbed the snow ridge west of the Prong the banners became clouds that poured over the Gunsight and then through the notch itself. In ten minutes, not far from a short steep couloir leading up to the upper Owen snowfields, a thin fog enshrouded us. We stopped. We looked at one another. It looked bad, I thought. Eric wanted to keep going and so I acquiesced. We took a few steps and not long after that we heard voices in the gloom. The Floridians appeared out of the fog. “It’s pea soup up there” they said. “We know from experience that weather that comes in like this will only worsen. We’re bagging it. Good luck” and, so saying, they vanished into the mist below us. I believed them; I felt that we should turn back. Eric opted for continuing, at least for a while; as long as we could see more or less where to go. After all it wasn’t really “pea soup” where we stood and there was little wind. We had a discussion that gradually became more of an argument. I for bagging; Eric for going on. It soon became evident to me that this wasn’t really an argument after all; that I faced an ultimatum, a Will of Iron. And so we continued onward. The short couloir “went” not so badly, just steep scrambling on wet rock and at the top we came to snow again but not so steep as before. No need now for the rope. On the featureless snow the fog didn’t seem to make much difference. At least we could see our footing. And we knew from having studied the route that the long horizontal Koven snow band angled up and left to a ridge south west of the summit pyramid; we couldn’t miss that. Suddenly the fog lightened a bit and then a small patch of blue sky swirled by—a “sucker hole” according to the wags. Then more holes! And finally the sky cleared and all became brilliant blue and white again, not a cloud in the sky, even to the west. 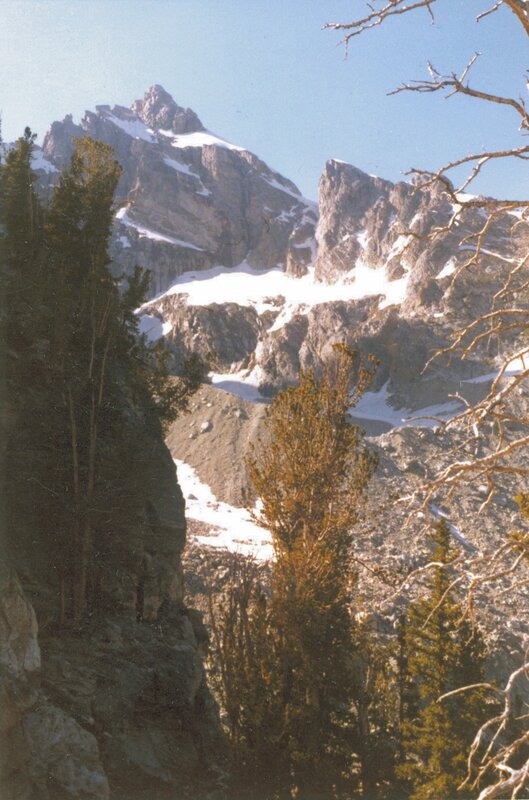 Upon turning the southwest ridge we could see suddenly and spectacularly beyond and over Table Mountain and into Idaho and, closer, into the great chasm of the South Fork of Cascade canyon 4,400 feet below. The ridge itself looked steep and hard but we knew the key to the route lay somewhere out on the exposed and vertiginous and as yet unseen west face; the route that Ken Henderson found while on a detour from his first ascent party to take a “whiz” in 1930. We crept up the ridge looking every now and then through a notch in the arete for the key and, eventually, it appeared; a narrow ledge maybe eight inches wide traversing away from the ridge on an absolutely vertical wall above a thousand foot sheer drop. Wow! 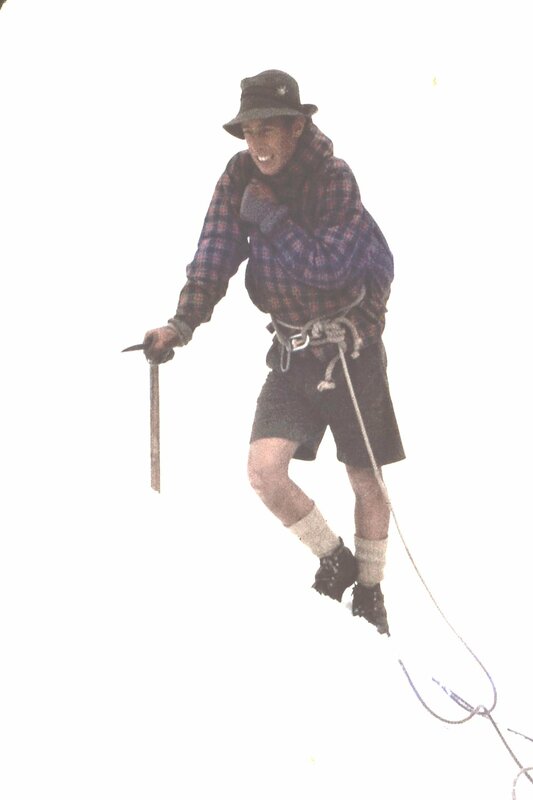 Belayed by Eric I traversed gingerly out, shuffling along, with pretty good hand holds, and after twenty or thirty feet I came to a chimney that seemed to widen above. In order to eliminate rope drag I brought Eric over and we switched leads. Eric went up and disappeared into the chimney. Intermittent movement; a long pause; no rope movement. Then some more movement and, finally, a faint and distant “On belay, Bill”. My pack got stuck in the chimney and it took me a while to wriggle free and upward. I poked my head from under an overhead obstruction there to see Eric silhouetted against the sky with the summit register held triumphantly aloft. I assume that he still had me on belay. We perched one at a time on the peak, about as big as a hassock, took some photo’s and had a bite to eat. It was 2:00pm. Our next objective, the notch of the East Prong, lay eight-hundred feet below down the precipitous east face of the summit pyramid. After three or four rappels, the last one down the short rocky couloir of the ascent, we had regained the notch of the East Prong above the steep snow slope dropping almost unobstructed to the glacier a thousand feet below. We roped up and, for a few pitches, reversed the procedure of the ascent. Eric descending first: belayed, plunge step, planting his axe at the end, and then belaying me down to his position. After a rope length or two we came under and against the huge vertical west wall of the East Prong itself. It had cracks and fissures and, a few yards downslope, a rock outcrop protruding into the snow so as to block a direct descent line. By then Eric had gained some confidence and we agreed that we would make better time on the rest of the descent by alternating leads. Eric placed a piton, tied in, and took me on belay. I moved out across the slope to clear the outcrop and then started downward. The snow had become soft in the afternoon sun and my heels mushed deeply into its corny surface. I wondered whether a self-arrest would work. Was the soft surface deeper than the length of my axe pick? Since I had a solid belay from above I called to Eric to “watch me” and began heeling down almost at a run. Inevitably I slipped and, rolling over onto my axe head, tried to arrest the slide. Just as I realized that the arrest was not working, the rope stopped me with a solid jerk. But immediately, as I turned to regain my feet, I began sliding again. Whoa! What? A sharp pull stopped me again. I waited a moment and regained my feet; I looked up. Eric had vanished! Nowhere in sight! I could see the little platform above where he had stood and there his ice axe alone thrust into the snow. I shouted, “Eric”! No answer. I climbed frantically back up until I had arrived just above the rock outcrop and there, wedged in the narrow bergschrund almost upside down and still clutching the rope, was Eric making muffled sounds and trying to extricate himself. At the first shock of my slide Eric’s piton had pulled out and he catapulted downward with no hope of stopping (without an axe) save his lucky but violent encounter with the outcrop. He remembers that his hammer had caught somewhere down inside the crevasse and that only its attachment sling had stopped the fall. Eric had hurt his knee (he found out later had cracked a rib) and lost his piton hammer forever to the crevasse. Together we got him out, rested, and reviewed options. The long steep slope below was not benign. Dotted here and there we saw groups of black rocks potentially fatal to anyone in an uncontrolled slide. We decided to descend cautiously again, Eric first, belaying every pitch. His knee bothered him but seemed not unduly incapacitating. By the time we reached the glacier his knee had swollen a bit. After a long slog across the glacier and the climb back to Amphitheatre Lake we collapsed at our tent site happy to rest and to make dinner in relative comfort. The next morning Eric’s knee seemed pretty painful and swollen but he could limp around and with tentative movement the joint improved. I agreed to take part of his stuff in my pack—not bad on the descent—and we headed slowly down the switchbacks to Lupine Meadows and the car. I think that night we probably went in to Jackson to celebrate a great week in the mountains. We had climbed more than two vertical miles in seven days. The next day, as I left for Buford to rejoin my family, I dropped Eric off for his long, solitary, hitch-hike back to Boston. * I returned to the base of the Falling Ice Couloir twice more in subsequent years and on neither occasion did it work out to have a canoe! Learning has its lapses. Neither did I ever do the Dike Route as I had thought I might.